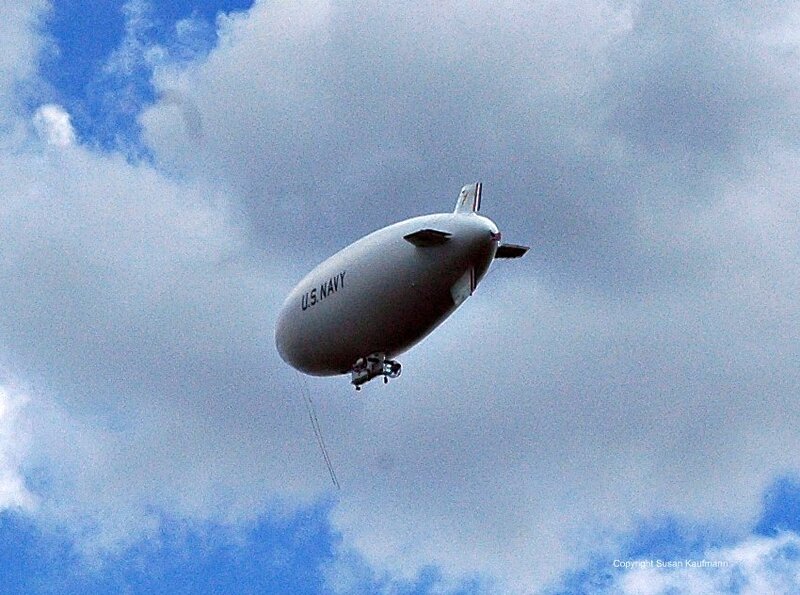 Hidden New Jersey: Aerial recon over the Turnpike, or just taking the blimp out for a spin? Aerial recon over the Turnpike, or just taking the blimp out for a spin? Driving the Turnpike South the other day, I noticed something small and roundish in the distant sky. I wasn't sure what it could be, given that the sky was filled with mostly grayish clouds, and I couldn't really differentiate the object's shape from what might possibly be a natural formation. To my delight, the object was heading north, almost as if it was getting on the Turnpike, too. Wait! It looks like... an airship! I couldn't see any markings from that distance, but it didn't appear to have the broad, colorful brand labels you see on an advertising blimp. My mind immediately went to the news coverage I'd read earlier this week: a prototype long endurance drone airship was set to be tested at Lakehurst Naval Air Station. Could this be it? I was near Exit 7, not so incredibly far from the base by air. I had to get pictures. Only problem was... the Turnpike. Had I been on Route 22 or 46 or 70, I could have just moved over to the shoulder or quickly turned the car to a parking lot. Obviously, you can't do that on the Turnpike, and I didn't really feel like meeting a State Trooper that afternoon. Just my luck, I was alone, so I couldn't even get Ivan to take a few snaps through the windshield as I drove. What to do? Exit 7 was fast approaching, and I considered pulling off there, but I couldn't remember if it was verboten to park or leave your car standing in a toll interchange. (Turnpike and its danged rules!) Then I saw my salvation: a sign for the nearby Richard Stockton Rest Area. Could I get there before the airship did? I passed up the exit, put the blinker on, and eased into the right lane for a quick slide into Stockton. Fortunately, movement was light in the parking lot and I was able to glide into a parking spot facing the highway. Nobody seemed to notice the airship as it grew larger in the sky and started to pass right in front of us. Well, except for a limo driver standing next to his town car, gazing skeptically upward. I grabbed the camera, and as I snapped away, I hoped the lens would be sufficient for the distance. Lettering on the ship's side confirmed it was a Navy vessel, and I could see the mooring lines hanging from its bow. Was it the drone in question? I don't know that much about airships, but this one looked pretty run-of-the-mill. Maybe, though, being mundane is part of its camouflage, of sorts. The excitement of running into something potentially great got deflated just a bit when I returned home. A little post-discovery research confirms that the prototype is significantly larger than the Turnpike airship. There's no specific word on when the big guy will take to the air; anytime between now and June 10 is as much as I've been able to garner. If you happen to be around Lakehurst over the next few days, keep an eye to the sky, and let me know if you see anything!